[232 Pages Report] Increasing demand for industrialization in emerging economies; evolution of IIoT, and increased communications and monitoring of machines; and growing demand for smart automation solutions are the key factors driving the growth of the operational technology (OT) market. The operational technology market was valued at USD 27.20 Billion in 2016 and is expected to grow at a CAGR of 6.7% between 2017 and 2022. The base year considered for the study is 2016, and the forecast period is between 2017 and 2022. 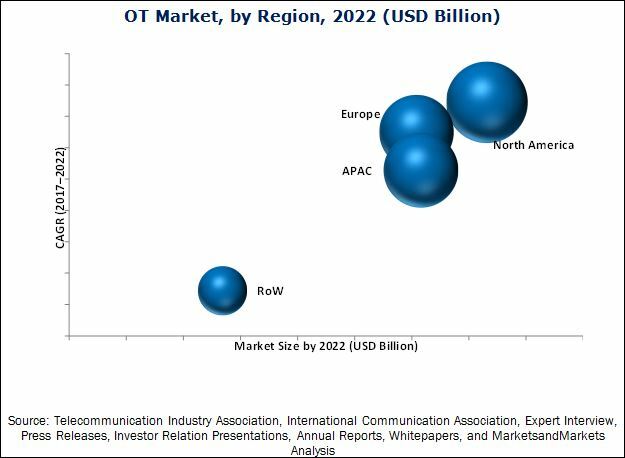 The objective of the report is to provide a detailed analysis of the OT market based on component, networking technology, end-user industry, and geography. 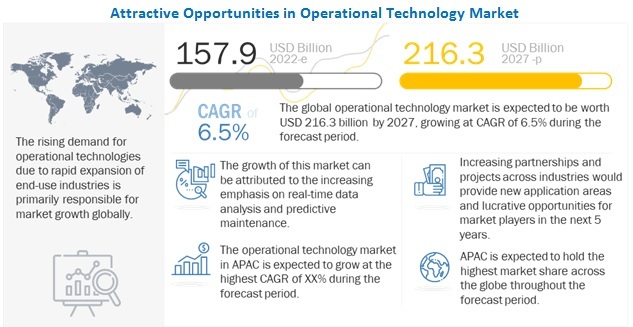 The report provides detailed information regarding the major factors influencing the growth of the operational technology market. The report also provides a detailed overview of the value chain of the OT market. The research methodology used to estimate and forecast the operational technology market begins with obtaining data through secondary research such as Telecommunication Industry Association, Automation Association, Industrial Internet Consortium, and the newsletters and whitepapers of the leading players in this market. The offerings of the technology providers and IT service providers have also been taken into consideration to determine the market segmentation. The bottom-up procedure has been employed to arrive at the overall size of the operational technology market from the revenue of key players. After arriving at the overall market size, the total market has been split into several segments and subsegments, which then have been verified through primary research by conducting extensive interviews with officials holding key positions in the industry such as CEOs, VPs, directors, and executives. The market breakdown and data triangulation procedures have been employed to complete the overall market engineering process and arrive at the exact statistics for all segments and subsegments. The breakdown of the profiles of primaries has been depicted in the following figure. The OT ecosystem comprises technology providers, system integrators, and IT service providers. The players involved in the development of OT solutions are ABB (Switzerland), General Electric (US), IBM (US), and Oracle (US), among others. This research report categorizes the overall operational technology market on the basis of components, networking technology, end-user industry, and geography. The operational technology (OT) market is expected to be valued at USD 40.42 Billion by 2022, growing at a CAGR of 6.7% between 2017 and 2022. The growth of this market is fueled by the evolution of IIoT, and increased communications and monitoring of machines; development in automation ecosystem through organic growth strategies such as mergers and acquisitions, and collaborations; and increasing demand for industrialization in emerging economies. Distributed control system (DCS) held the largest share of the operational technology market based on control systems in 2016 and is expected to grow at a high rate between 2017 and 2022. The hastening adoption of IoT has increased the use of connected devices in various process industries. Thus, the demand for automation will continue to drive the market for control systems such as DCS, supervisory control and data acquisition (SCADA) systems, and programmable logic controllers (PLC). The rapid demand for digital transformation has raised the requirements for control systems. Moreover, IIoT is urging the industries to automate their plant and their production process to gain a competitive edge over the peers. Predictive maintenance services accounted for the largest share of the operational technology market for services in 2016, and the market for the same is expected to grow at the highest CAGR between 2017 and 2022. Predictive maintenance software is designed to help control the condition of in-service equipment to predict the appropriate time at which the machines will need maintenance. This approach assures cost optimization over routine or time-based preventive maintenance. Wired technology accounted for a larger share of the overall operational technology market based on networking technologies in 2016. Wired technologies are safe and unfailing technologies. Hence, they continue to remain as the more preferred networking technologies in the industrial organizations. Among wired technology, Ethernet is most widely used in process industries. This technology is widely used as it offers real-time operation; protection against harsh environment; and faster, safer, and comparatively low-cost data transfer than other wired technologies. Among the process industries, the oil and gas industry accounted for the largest share of the overall operational technology market based on end-user industries in 2016. Since the past few years, the global oil and gas industry has been witnessing challenges such as falling oil and gas prices, sluggish demand and environmental concerns. OT enables the oil and gas industry to monitor the facilities remotely and gain knowledge about daily inventories and the equipment condition. Increasing number of oil and gas companies is investing in the improved control systems, software, and analytics to optimize their operations and give them a competitive advantage. North America is expected to hold the largest share of the operational technology market during the forecast period. The players in North America are emphasizing on modernizing their plants and facilities with advanced technologies. Furthermore, the adoption of smart automation technologies and a significant number of established OT players are driving the OT market in North America. The key restraining factors for the growth of the OT market are supply chain disruptions, and lack of efficient government initiatives. The key market players such as General Electric (US) and Siemens AG (Germany) are focusing on the strategies such as new product launches and developments, expansions, contracts, and collaborations to enhance their product offerings and expand their business. Also, they have launched disruptive platforms which are currently booming the market.